Featured in BeerBods Plus box 4 on 12 April 2018. Find the brewery on Twitter at @RedchurchBrewer and on Instagram at @redchurchbrewer. 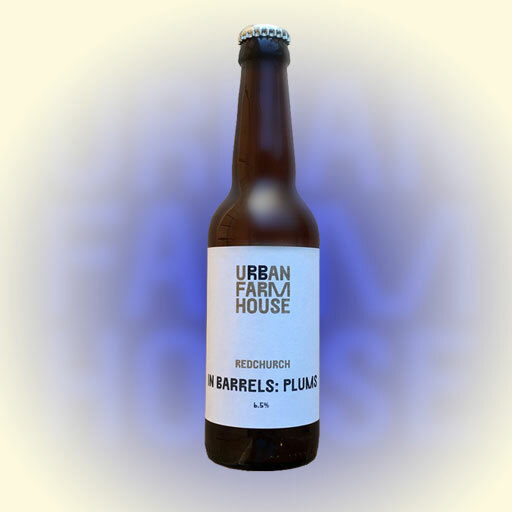 This is a sour beer with plums that has been aged in Pinot Noir barrels. Expect a tart acidity undercut with red wine tannins, and stone fruit sweetness to balance the sour notes. The barrel ageing introduces the possibility of oak and vanilla flavours. Look out for some funk from the spontaneous fermentation. Anything you’d think to put with red wine has a chance of working well here thanks to the ageing in Pinot Noir barrels. The fruity plums notes and the acidity suggest it might work well against rich, fatty foods to cut through and cleanse the palate. Game or duck, for instance. For something a little simpler on a Thursday night, try it with some cheese. Again the acidity is going to play off the dairy/fat nicely, and the fruit and funk should do well against a robustly flavoured cheese. Try a blue cheese, or something rich, old and stinky. Get more info on this beer from BeerBods.